If you think that Pottermania has died down in the wake of Twilightmania and Hobbitmania, you haven’t seen the cheering crowds at Potted Potter. On opening night the Panasonic Theatre was filled with a mob of adults and children equally psyched up to celebrate all things Harry Potter. For, indeed, a celebration of J.K. Rowling’s Harry Potter books is exactly what Potted Potter is. The word “potted” may seem to imply some sort of satire, but the show never sets out to satirize the Potter books. That would only alienate the crowd. 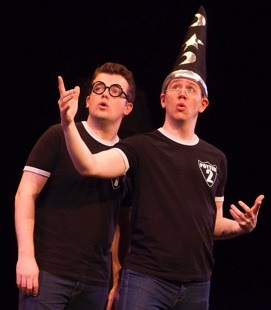 Instead, Potted Potter celebrates Rowling’s seven-volume epic by satirizing the attempts of only two performers to bring all seven books to life on the stage in only 70 minutes. The result is very like a Harry Potter panto that will please both adults and children alike. Ever since the success of the The Complete Works of William Shakespeare (Abridged) by the Reduced Shakespeare Company in 1987, performers have been finding humour in impossibly massive endeavours staged by small casts in short periods of time. 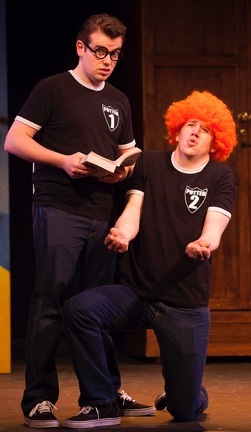 Daniel Clarkson and Jefferson Turner followed in the wake of the Reduced Shakespeare Company and its five other abridgements in 2006 when they presented the first Potted Potter in Edinburgh before Rowling had even published Book Seven. Unlike Shakespeare (Abridged), Clarkson and Turner do not seek to make fun of their source but rather shift the burden of humour to the challenge itself of staging such an epic story of fantasy and magic. devices Percy thinks he needs to tell the story. Instead, Percy realizes that he and Stratton will just have to muddle through trying to tell the story themselves with the paltry means at their disposal. Besides a cute multicoloured wooden locomotive and tender, Stratton has constructed three useless props. One is a coffin marked “spooky”, showing he understands nothing about the Potter series. The second is a beach scene marked “Forbidden Forest”, showing he understands nothing about forests. And the third is a wardrobe. Why? So that the children can get to Narnia. The second two of these items get big laughs from the children. They know what a forest is and, unlike Stratton, they know that Narnia has nothing to do with Potter. In fact, the children especially are eager to catch Stratton out whenever he claims that some element of The Hobbit, the Twilight series, Star Wars or Shrek is part of the Potter books. It’s quite delightful to see what feisty purists young Potterphiles are. It is also a pleasure to note that Potted Potter continues to refer almost exclusively to the books, not to the movies made from them. The only references to the movies are to Daniel Radcliffe, Emma Watson and the fact that Book 7 was split into two films, and these appear more as improvised remarks than parts of the script. Keeping the focus on the books, besides promoting reading, also allows Percy and Stratton to interpret Rowling’s characters any way they like. most of his quick changes while behind the wardrobe as he runs in circles around it. Percy and Stratton give themselves a rest for Book 3 which is shown as a PowerPoint presentation on a screen that folds out from the wardrobe. While the presentation emphasizes how complicated Book 3 is, it also relates its underlying structure quite clearly. Following Book 3 comes Book 4 and the World Quiddich Cup. This is the perfect introduction for the live quidditch game advertised on the Potted Potter posters and heavily touted at the top of the show. Two children are chosen from the audience as Seekers and the entire audience is divided into two teams. How the game progresses from that point on I will not reveal except to say that it is wonderfully imagined and absolutely hilarious. The two last books are the longest but here are the most condensed. The final showdown between Harry and Voldemort is boiled down to a sing-off between the two actors standing at mics singing new words to the Gloria Gaynor’s hit “I Will Survive”. It’s a totally daft but rousing finale to an evening that has been totally daft but rousing from the start. Percy and Stratton both generate such energy and work in sync together so perfectly you would never know they were not the originators of the show. Both are also expert physical comics and improv artists which comes in handy when anything in this fast-paced, action-packed show goes wrong, such as when Voldemort’s snake Nagini (a stuffed toy) accidentally slipped out of its leash and wound up hanging from the wand in Percy/Harry’s back pocket. With its strong storytelling leavened by unscripted humour, topical references, audience participation and re-use of old songs, Potted Potter is very like a panto and, in fact, manages to be funny without slipping in naughty bits for the adults as at Ross Petty’s pantos. The more you know about the Harry Potter books from reading them, the more you will enjoy the show, though even if you know the story from the films or even from hearsay, you can’t fail to be impressed by the comedic talents of Percy and Stratton. This fact makes Potted Potter an ideal holiday outing for families since it is only 70 minutes long or for groups of dedicated Potter fans. While children will enjoy re-hearing the story and laughing at all the slapstick and slip-ups, adults will also savour the inherent paradox of the show. 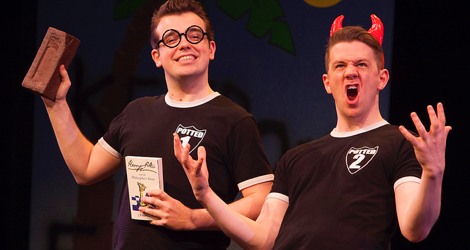 Potted Potter does fail to bring Rowling’s seven Potter books to the stage in any kind of detailed fashion, but it is a case where the duo’s inadequacy only stimulates the imagination to fill in the events it merely sketches out. The Chorus to Shakespeare’s Henry V urges the audience to “eke out our imperfections with your thoughts”, and that’s exactly what we do in response to the deliberate imperfections of Potted Potter. In doing this the show creates a completely theatrical experience that in its own loony way amounts to an exhilarating communal celebration of the world of Harry Potter. Like the “Rictusempra” spell, it will cause you to laugh uncontrollably. Photo: (from top) James Percy as Harry and Ben Stratton as Voldemort; James Percy as Harry and Ben Stratton as Ron Weasley; James Percy as Harry and Ben Stratton as Dumbledore. ©2014 Starvox Entertainment.